McGill's Repair and Construction, LLC | Page 3 of 7 | Servicing Southern Iowa's Electrical, Heating and Cooling needs since 1990. 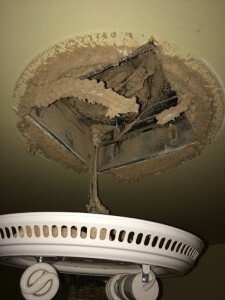 The bathroom exhaust fan plays an important role in removing excess moisture from the area. It’s a good idea to run the fan for 10-15 minutes after using the shower to reduce the humidity. 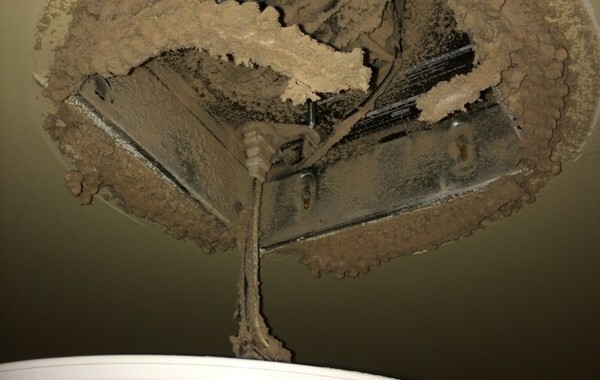 One common problem experienced over time with exhaust fans is the collection of dust and lint inside the fan. You may not notice how dirty the fan actually is until it starts to make noise or lint is clinging to the vent cover. 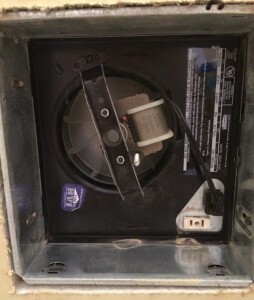 Cleaning your exhaust fan can be a DIY project if you are comfortable with disassembling the fixture. If you would like assistance or your project requires electrical repair, please call us. The example we’ll use today is a combination light and fan unit. It has been in service for approximately 10 years according to the home owners. With the services preformed on this unit it should be good to go for many more years. Our subject for today. 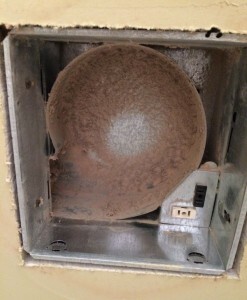 Notice the dust and lint trapped inside the vent openings. 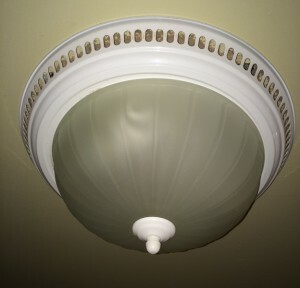 View of light fixture with globe removed. 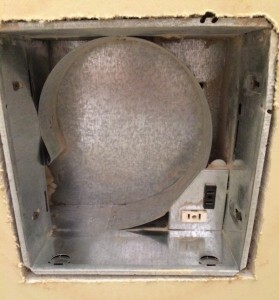 To get access to the fan unit the light fixture housing must be removed. On this unit the center rod secures the light fixture to the ceiling. Remove the center rod and slowly lower the fixture. 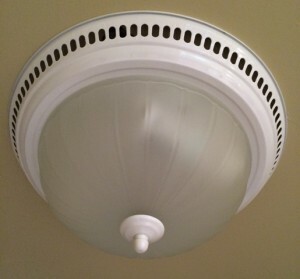 View of exhaust fan under lighting fixture. Wow, look how dirty it is. No wonder it was making noise. 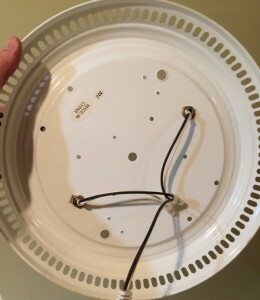 On this combination unit the lighting fixture generally has a short cord with plug-end that connects to the fan housing, simply unplug the power cord and set the housing aside. View of exhaust fan motor. 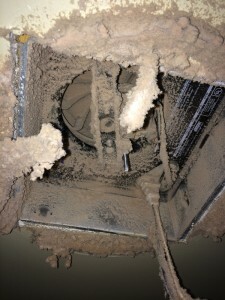 The fan motor and blade is very dirty and needs cleaned. The noisy operation is most likely caused by imbalance in the fan blade due to the weight of the dirt. The dust and lint is also restricting air flow. To access the fan blade the fan assembly will need removed from the housing.. On this unit the fan assembly has metal tabs that connect into the housing. View of fan housing with motor removed. With fan assembly removed we are able to clean the inside of the fan housing. Use a vacuum with brush attachment and wipe with damp cloth. Next vacuum the dust and lint from fan assembly. The blade can be cleaned using damp cloth and mild soap. Avoid getting water on motor. Once clean, reinstall fan assembly into housing and test. Next, clean the light fixture and inside of vent cover, reinstall over fan. Light fixture housing after cleaning. 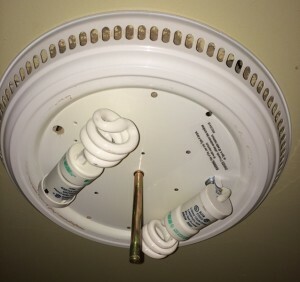 Replace light bulbs if needed. Clean and running like brand new. There, all done and looking great. 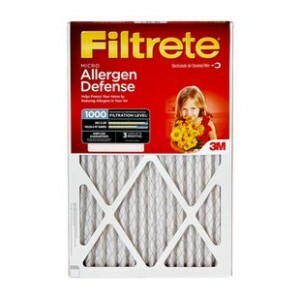 We also recommend cleaning the vent cover on the outside of the house. Note – If the fan unit is not easily serviceable then it may best to install a new unit instead of spending time and money on old unit. If you have questions or would like to schedule a technician to perform maintenance, please contact McGill’s Repair and Construction at 641-437-1086. It’s certainly starting to feel like fall outside. 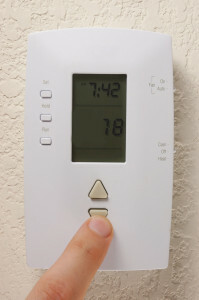 With colder temperatures coming soon, now is a good time to check your furnace and perform some simple maintenance. If you would like to have your heating system checked out by certified HVAC technicians please give us a call at 641-437-1086. Here are a couple of maintenance tips to help you prepare for the cold weather ahead. They are simple but important. 2. 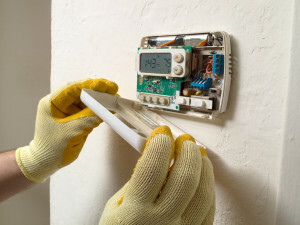 Replace battery in your thermostat. 3. Test furnace in heat mode. 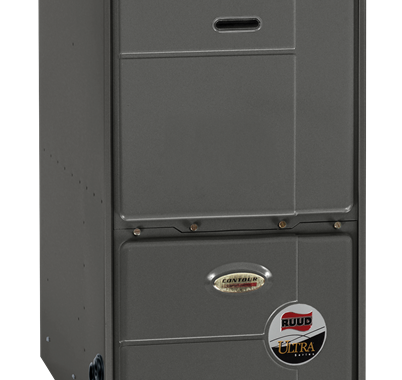 If you have any questions or concerns about your furnace operation please give us a call at 641-437-1086. We are happy to help.